More than 67 million people watched the first presidential debate of this election cycle — nearly 15 million more people than watched the first presidential debate four years ago. That 67 million, however, falls very short of the Mother of All Presidential Debates: the Oct. 28, 1980 smackdown between President Jimmy Carter and Ronald Reagan, which had drawn a whopping 81 million viewers. The debate was carried live across 11 networks; Telemundo aired it on tape delay. In a tight race at the top, ABC appears to have, once again, snagged the most viewers to the first presidential debate of this election cycle — like it did four years ago. About 11.25 million people watched Romney vow to axe Big Bird, on ABC. That’s up a tick from four years ago when 11 million people watched Sens. 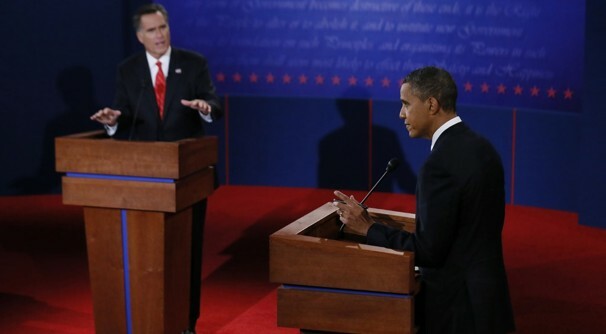 John McCain and Barack Obama in their first face-off, which had also been moderated by PBS’s Jim Lehrer. Lehrer got better reviews in ’08.